Mongolia's Prime Minister Norov Altankhuyag has been removed after MPs, including some from his party, voted to dismiss him. He had been accused of economic mismanagement, corruption and nepotism. 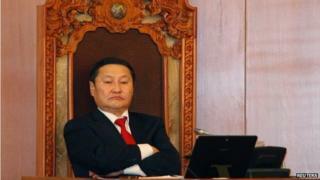 One of Mr Altankhuyag's close aides is now being investigated for embezzlement of coal subsidies. Mineral-rich Mongolia had seen rapid economic growth in recent years but this has slowed sharply, as has foreign investment, while inflation has risen. Out of the 66 parliamentarians who voted on Wednesday in a special meeting, 36 chose to oust him. Another 10 did not show up. Deputy Prime Minister Dendev Terbishdagva has been placed temporarily in charge until a new prime minister is elected. The move is the latest development in ongoing political turmoil. In recent weeks, seven ministers have resigned after Mr Altankhuyag consolidated some ministries, prompting calls from the opposition for him to step down. The country has yet to pass a budget for this year - parliament rejected a budget proposal for the second time last month amid criticism of exorbitant spending. Mongolia has had a strong economy in recent years, gaining 17.5% growth in 2011. But that figure has since slid to 6.3% currently. Foreign investment has dropped by 59% this year, as the government continues to negotiate the development of a copper and gold mine with mining company Rio Tinto. A former natural environment and tourism minister who was also a senior adviser to Mr Altankhuyag was arrested in July for embezzlement. Gansukh Luumed is being probed for taking money from a coal subsidy programme meant for poor residents living in slum areas of the nation's capital Ulaan Baatar, according to reports. Mr Altankhuyag had said at that time that Mr Luumed's arrest was an act of "sabotage" on the government.